Hi friends! 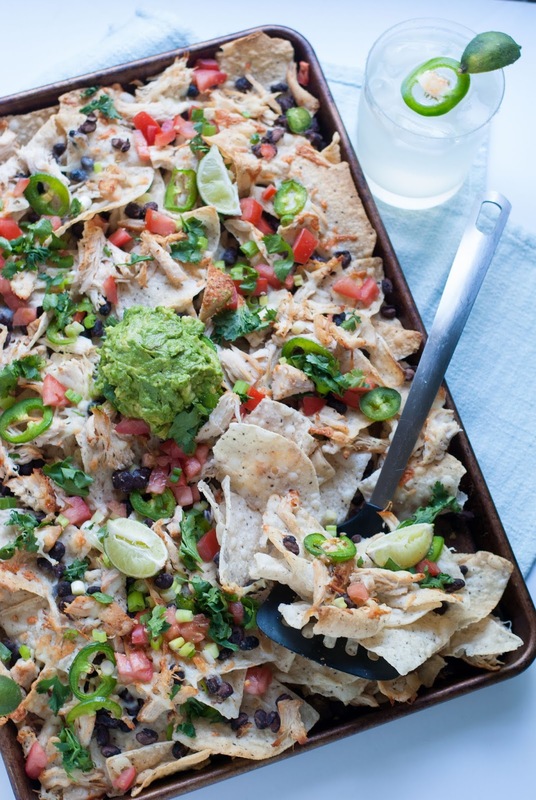 Cinco de Mayo is Saturday, so I wanted to share one of my favorite sheet pan nacho recipes. There isn't much better than nachos and a good, cold margarita on a warm day! These are so easy to throw together and you can load it with whatever toppings your heart desires. Now go grab your sombrero and get festive! 1. Preheat the oven to 400° and place chicken in a baking dish or pan. 2. Drizzle with olive oil and fajita seasoning. 3. Bake in the oven for 10 minutes and then flip and cook for another 15 minutes. The internal temperature should be 165°. 4. Let cool and then shred. Set aside. 2. Spread out your tortilla chips onto a rimmed baking sheet. 3. Top with black beans, shredded chicken, shredded cheese and jalapeno slices. 4. Let nachos cook in the oven for 10-15 minutes, or until the cheese is melted and slightly browned. 5. Remove from oven and squeeze one whole lime over everything. Top with your desired toppings and enjoy!